This year has had its fill of highs and lows. 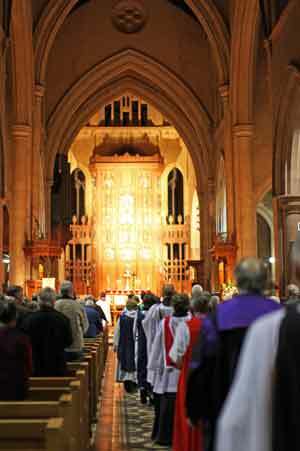 A major event was our 20th anniversary, celebrated at Evensong in St. Peter’s Cathedral in Adelaide on May 14. Bp. David McCall (Willochra), who called us into Community in 1997 preached a wonderful sermon, and at the supper afterwards we caught up with many friends who have accompanied us on the journey over the years. The presence of those from other communities was especially appreciated. (Willochra), Srs Sandra Sears & Sue Nirta. 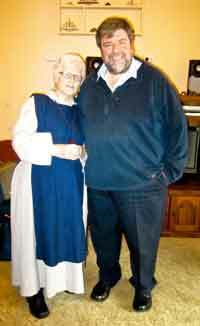 Sadly, Sr. Jeanne Frost (Seen here with Bp. Garry Weatherill) died shortly before our celebrations. Her funeral took place only three days before at the Church of the Good Shepherd, Plympton. It was a time of sadness, but also celebration, as she had been involved in Mothers Union and many other church activities during her lifetime. Her husband, Bruce (deceased) served a priest in the Diocese of Willochra for many years, having been born and raised at Riverton.Sr. Jeanne was professed in 2006. We miss her greatly. (right) made her vows as a novice of the Community, and four members of the Gladstone community, who have supported us for many years, were admitted as Friends of the Community. Also another longtime friend of ours, Thic Thong Phat (Thay) was welcomed as a Friend of the Community. 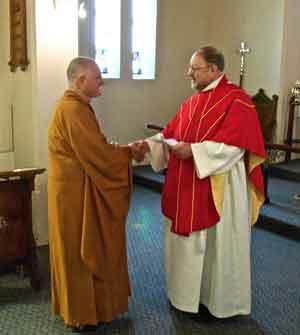 Thay is a Buddhist Monk in the Vietnamese tradition, having formerly been Anglican. He brings a wealth of experience to us in meditation and spiritual practices that span both traditions, together with a lively sense of humour. Back row: Br. Martyn, Maurie Penn & Allan Kendal (Friends), Sr. Sue, Thay, Sr. Sandra. Br. Martyn is kept busy in his veggie garden, spreading lots of animal pooh and joy (sounds suspiciously like a stable we have heard of) as well as building ‘the ark’, his little boat. Ever the sailor! Sr. Sue has settled into her new home – much smaller than the previous one – and had a couple of trips to South Korea to be with her daughter (Lauren) and her family (2 grandchildren). Her other daughter, Kai, is expecting a baby in February, so Sue is on high alert. 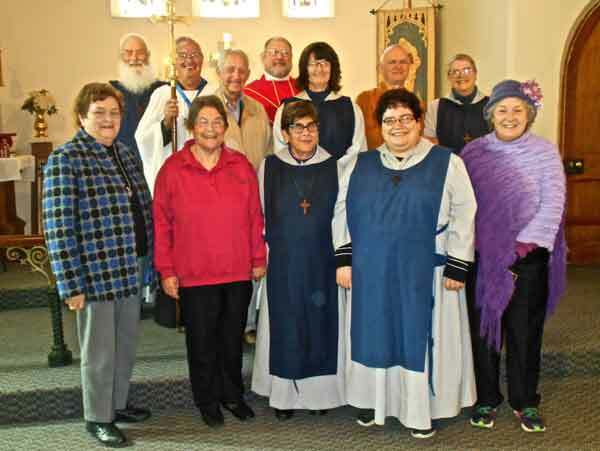 Sr. Bev has retired from her sacristan duties at St. Margaret’s, McClaren Vale and is adjusting to her new life. She brings her creative skills to her garden and craft work. Sr. Cheryl continues in her work as a nurse in ICU at the Royal Adelaide Hospital. This was complicated this year as the hospital was moved to a brand new site, which required a great deal of work and adjustment on the part of the staff. She also continues to be involved at her local church, and with Stillpoint Ministries at Mt. Barker. Sr. Pauline has spent time in hospital with fractured ribs after a fall in her back yard in mid year. She is slowly recovering, and is still active in her church. Her ministry of prayer, especially for her family, has been bearing fruit, with gradual healing in relationships and physical problems. Sr. Riccarda continues with her work in a nursing home. Her hours are now more predictable, which makes it better for her. She also cares for her husband (dementia) and is besotted with her grand daughter. 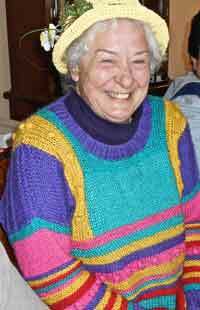 Sr. Katherine writes poetry and songs, and is involved in a writers group in Gawler. She travelled with her parents to Taizé in September to visit her brother, and England to catch up with friends and relatives. 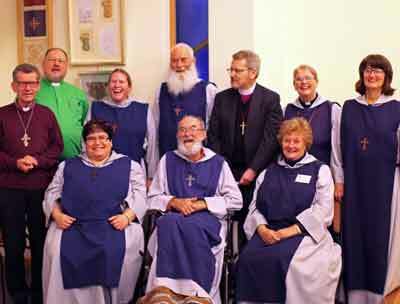 She has just begun chaplaincy work at a local nursing home, having done an introductory course. Br. John celebrated his 88th birthday with a party at the pub in Maitland, York Peninsula, arranged by his son, Norman. Sr. Sandra and Br. Martyn were able to be there to celebrate with him. He has had to move from his home into a local nursing home, and it took some time, and a couple of mishaps, to get the best combination of care and medication. He is now a happy resident of the nursing home wing of the local hospital. Sr. Sal also turned 88 this year. She is in a nursing home in Stansbury, Y.P., relatively close to her family in Edithburgh, just down the road. Her prayers and wisdom are much appreciated. Sr. Sandra has up until recently continued her chaplaincy at Willochra home in Crystal Brook, as well as taking services at Gladstone, Georgetown and Laura. However, chronic tiredness and other symptoms have led to medical investigations which are ongoing, to the point that she has had to give up – at least for the time being, any work. 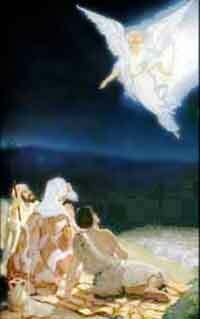 She continues to write poetry and short ‘parables’ which appear on our website. Susan Coleiro, our novice: Susan is in her 60’s and lives in Gladstone. She first became interested in the Community about 4 years ago, and has recently made her commitment towards membership. She has adult children, and it passionate about nature, which translates into a deep love of animals (particularly strays – very Franciscan!) and gardening. and drown in his love.